Well, my son made a liar out of me today. He passed his swallow study. Apparently, he can swallow, and when he’s forced to, he will. He had his swallow study this morning, and despite a lot of choking and gagging (but not as much drama as I had feared), both the liquid and pudding they gave him went down and he swallowed 4 or 5 times for the team of doctors, radiology techs, and med students that crowded the procedure room. The doctor told us it is in fact safe for him to work on eating and drinking, in therapy. This is great news for us, but tells us we really need to increase our feeding therapy! I was so impressed with the hospital- everyone was especially nice to us (the weather? Spring Break? just really nice people?). We arrived really early because I had to go by the pulmonologist’s office to sign a medical records release form. Our appointment was at 10:00, but we checked in at 9:00. Ya’ll, we were DONE with the swallow study and walking out of the hospital at 9:45. Amazing. Since we were already down in the Med Center and it was so early, we decided to hop on the Metro Rail and take a short ride down to the Rodeo. For those of you not from Texas, the Houston Livestock Show and Rodeo is here for 3 weeks every year, and all us Texans pretend we really are the stereotypical cowboys and cowgirls that people from other states think we are. We had already planned to go to the Rodeo tomorrow and dress G in cute Western duds, but it was totally worth it to go today instead, with the money we saved on gas and parking! So this is the part of this post where I had hoped to show you adorable pictures of Grayson petting his first goat or alpaca at the Livestock show petting zoo, but sadly the whole thing was overrun with daycare fieldtrips, with kids scurrying around like ants. Ryan looked at me like I was nuts for even considering an attempt at getting in the zoo, so we decided to give up on that idea and instead go outside for barbecue sandwiches. They did not disappoint. So here’s my only “Grayson’s First Rodeo” picture- pretty pathetic. Two observations about this picture though- he looks SO big to me and he looks like he is totally faking being asleep. But he really was asleep. Hmm. So then we came home and Grayson crashed, I attempted to crash, and Ryan went to get my oil changed and find out about fixing my car radio, which works about 70% of the time. OH- and I have a question. Is it “common sense” not to get a carwash the same day as getting a brand new windshield? Because I did both yesterday. And when I told Ryan he said I should have known not to get a carwash because it was, in fact, “common sense”. I beg to differ, but maybe I’m just an idiot. But my car was really dirty. So please, everyone pray that my windshield doesn’t come crashing in on me while I’m driving now. Anyway, it was a really, really nice family day- much more pleasant than I was expecting. Tomorrow we are planning a trip to the mall to buy Grayson some new jammies and us a new set of sheets for our bed. Always and adventure around here! What a cutie! Glad he passed. Now for the er .. um .. fun with feeding therapy? :)That picture brings back SO many memories – pant legs riding up from the tubing! We actually used velcro straps (like they sell for containing appliance cords) to wrap the tubing closer to the bottom of the stroller. But we're New Englanders and legs can't hang out in the middle of winter! I have never heard that before either, when I read it I assumed he said it because the car would get dirty again, does it really effect the staying power of the windshield? I know i have said this a few times but it is such great news he passed his swallow study. I hope that the therapy goes well. I am so excited to know that soon (in faith) we will be seeing pics of Grayson taking some bites!!!!! YEA!!!! so weird about the windshield! 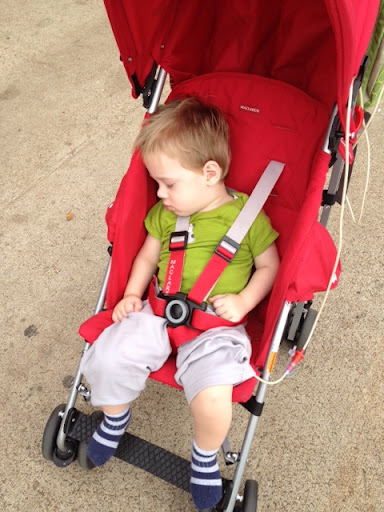 i would have never known.yay for passing his test!he really DOES look big in the stroller! the rodeo sounds fun; and the bbq sandwich was probably amazing! So so happy that he passed the test and you can now go forward with the work on food. Even better it was a great day overall and fun at the rodeo!! !